South Africa is home to 70 per cent of the world’s 29,500 rhinos, and rhino poaching– the practice of hunting, killing or capturing animals for their parts and selling it on the black market – has increased significantly in recent years. According to the South Africa Department of Environmental Affairs (DEA), poachers killed a total of 1,028 rhinos and 67 elephants in the Kruger National Park in 2017 alone. 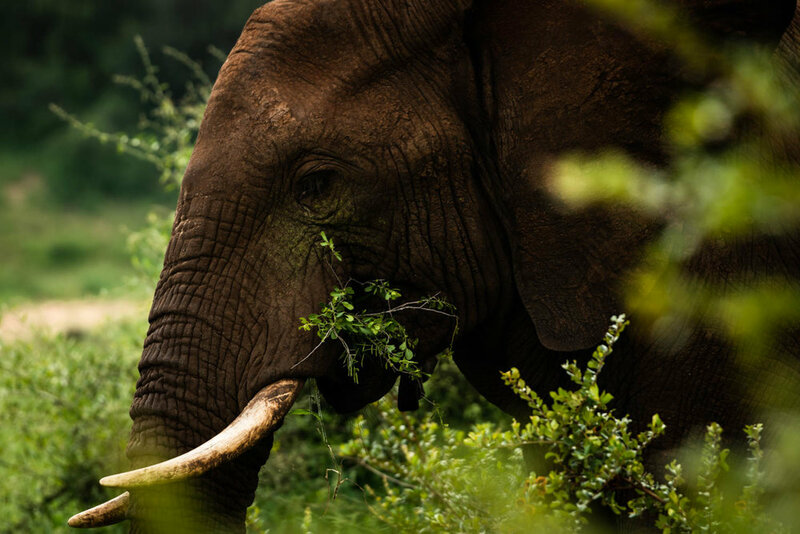 African elephants are facing extinction within a few decades, with the rhino following closely behind, unless an immediate and drastic change take place. Recognizing the vulnerable situation of the African elephant and rhino, many game reserve owners and anti-poaching units have resorted to protecting these animals through the use of firearms, and often altercations can turn deadly. However, this approach to eliminate poaching can breed a cycle of violence and does not solve the root of the issue. “To shoot and kill a problem, that’s the easy way, but it’s not solving anything,” says Vincent Barkas, founder of Protrack, a local anti-poaching unit. The matter of poaching is not one-dimensional, and it is largely rooted in poverty. According to Barkas, “A black person coming from the communities [earn] maybe 5,000 rand a month, that same person could get 250,000 for shooting a rhino.” Demand for illegal rhino horn and ivory from overseas buyers continues to increase despite government bans on international trade. In a sense, it is a tragic continuation of a generations-old cycle of colonialism at the expense of those who call South Africa home, as people see the descendants of colonizers benefitting from wildlife through tourism; making money off “property” that once belonged to their own ancestors. For many millennia, the tribes of South Africa had an enduring relationship with the land. It was not until colonization, and later Apartheid, that the connection between land and people became more and more controlled and imbalanced. It was only in 1994 that Apartheid officially ended, but the classism and racism persist in various ways. “Kill a poacher, save a rhino,” is a common phrase on bumper stickers, billboards and signage in South Africa. The phrase is an emblem of the general climate around addressing poaching, especially in places like Hoedspruit, Limpopo, which borders on the Kruger National Park, one of the largest game reserves in South Africa. The town, while small – with approximately three thousand people—has grown in recent years, due to the proximity of private game reserves and growth in eco-tourism as a significant contributor to the local economy. Conservation is largely a “white man’s” game in South Africa, in that it is mostly the white population who own game reserves, and also and have a stake in preserving wildlife. According to Protrack, poachers have been known to mutilate the bodies of rhinos and elephants that they kill, as a message to conservationists, who they feel place more value on wildlife than the lives of those in the black community. Fortunately, however, many are starting to see that villainizing poachers is not the way forward. Sarah Berg lived her entire life in the bush, living a privileged life at a lodge in a game reserve. Growing up, she saw the effects of Apartheid all around her and has been working ever since to dismantle and re-integrate values surrounding poaching and how the matters are addressed. Berg remembers as a young adult seeing tourists from all over the world spending a significant amount of money at the reserve, yet the local communities never benefited. The poorest residents of the Kruger Park community, disproportionately represented by Black South Africans, have historically been marginalized outside of the conservation areas. Nourish is Bergs' response to this issue, and what started as a grassroots community project, has become one of the leaders in advocating eco-tourism and promoting environmental education to marginalized communities in Hoedspruit. They work to uplift local communities by connecting conservation issues and community issues, believing that poaching can stop through fighting poverty, and education. Nourish works closely with young people from neighbouring marginalized communities. Many of them will grow up to be “poachers,” as a means to provide economically for their families. With opportunities for education, to be properly “nourished” not only with food but also with experiences, these young people can develop an organic love of nature and wildlife. It is through this exposure that love and appreciation of conservation and natural heritage can be fostered, helping them to return to a connection to nature, and a way of life that has been robbed through apartheid colonial structures. Volunteers at Nourish bring children to meet with Protrack, which in turn builds a positive relationship and the opportunity for students to view the staff at Protrack as role models, and mentors. The students receive free education, food, gardening classes, and after-school programming. They also offer students immersive experiences, such as going on field trips to Kruger National Park, where, (often for the first time) the students might get to see an elephant in the wild. Nourish works with everyone in the community, from toddlers to grandparents, employing grannies from neighbouring communities to provide nourishment to the children and grow powerful medicines such as moringa. It is a holistic way of looking at poaching intervention through working with all members of the community. Violence begets violence, and when the breadwinner of a family or a valuable member of a community is killed, it has repercussions that may ripple outwards in unimaginable ways. Poachers are people, and in South Africa, they tend to be people who have been oppressed systematically but who deserve the same chance for a good life. “It’s pointless looking after our wildlife if we don’t look after of our people. We have to put the people first if we really love animals,” Barkas reminds us. Nourish provides a model that many other nations can look up to as well; one that takes into account the history of oppression and the disruption of a more natural relationship to the land. All of which has led to the problem of poaching as we know it today. For more on Nourish, and the complexities behind combatting poaching in South Africa, watch “Beyond the GUN, the latest short film from PWB. This article was first published in PWB Magazine #11, on sale now.